Discussion in 'Skins' started by silentshadowxp, Jan 22, 2012. UPDATE! I've decided to finish this project. It's a bit less thorough than I originally intended, but I am content with the final state of it. See the finished project HERE. 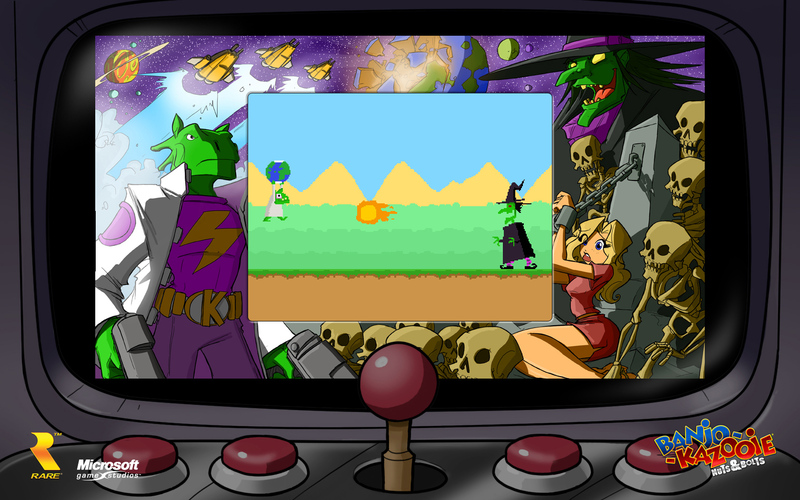 - Castles are Gruntilda's Lair. - Toad is Bottles and Peach is Tooty. - Hills are molehills and Spiral Mountains in the distance. - Clouds are based on the floating islands of Cloud Cuckooland. One has Wumba's Wigwam and one has Mumbo's Skull. - Water you don't swim in is based off of Clanker's Cavern and the lava is Bubblegloop Swamp water. - Used boxes are based off of Rusty Bucket Bay, bricks are beehives and ? blocks are based off of Stop 'n Swap eggs. - Mushrooms are honeycomb pieces, poison mushrooms are Grunty game pieces, 1-ups are Banjo extra life statues, flowers are Mumbo Tokens, stars are gold feathers and coins are music notes. - The axe to beat Bowser is now the Ice Key. - Red coins are red Jinjos and Yoshi eggs are Jiggys. - Pipes are based off of Dingpot. - Springs are Dragon Kazooie on a shock jump pad. - The vine is from outside of the Treasure Trove Cove entrance. - And the thing that fires bullet bills have the same logo on the backs of Gruntlings. - Goombas are Uggers, Buzzy Beetles are Snippets, Spike tops are Bigbutts, Green Shell Koopas are a mix of Gruntydactyls, Tee-Hees and Rippers, Red Shell Koopas are a mix of Buzzbombs and Termites, Cheep Cheeps are Chumps and Snackers, Piranha Plants are Slappas and Grill Chompas, Hammer Bros are Sir Slushes, Bullet Bills are Broomsticks, Bloopers are Inkys, and Lakitus are Mr Patch. Thisss isss Hero Klungo from Hero Klungo Saves teh World! If you watch this video, you can see what it was all about. It was a cute game that was mostly just for laughs. The game was "made by Klungo" from the Banjo Kazooie series, and features a protagonist with only two sprite animations. Because of that, I tried to stay as true to that as possible, but I made some exceptions. One such exception came in the form of baby Klungo! Isn't he cute! There are also some other custom sprites but I tried to keep it to a minimum, and make them fit as close as possible to the mini-game. Bass Seemed like the perfect choice for skinning Banjo, since it allowed me to use Kazooie and her Egg Firing. I made the different powers things from the game. Blue, fire, grenade, ice, and golden eggs make an appearance, as well as a magical Stop n' Swap egg. Bottles teaches you the beak barge, the Glowbo gives you super strength, and the Cheato page gives you golden eggs. I got a little bit silly with the pharaoh shot, making the mumbo skull give you powerss that summon the bee transformation, the t-rex transformation, and the washing machine transformation. I can't take full credit for this though. This picture is what inspired the look of banjo, but there was only one sprite of him so it took a lot of work to make this. I'd say Banjo's face is about the only thing from that sprite that I really used, but I still have to give the creator of that image some credit. This is my first theme and it's looped background. This is pretty basic. Check under the Klungo skin for a video of it in action. Had to edit the grass a bit, but it looks pretty much the same. Based on the level Glitter Gulch Mine. Since Treasure Trove Cove has to be my favorite 3-D platformer level of all time, it gets the special treatment. I made themes based on it for both underwater levels and bridge levels. Backgrounds are still in the process of being made, but will include more than just TTC stuff. All that's left are more themes! Magenta, Mr. Irken, pdba and 8 others like this. Wow . . . you fit so many elements of Banjo-Kazooie into this, and in ways that really fit! I'm impressed! Hmm . . . I wonder if there's an 8-bit version of the Spiral Mountain theme around somewhere . . . There are some 8-bit tunes in Klungo Saves Teh World. It was a minigame from Nuts and Bolts. I plan on making a Klungo skin for Mario and the Gruntilda from that game over Bowser. Ok, time for round two of sprites! Again, most of these are Custom Sprites that I've been working on for a couple days, so I'd appreciate feedback! Only problem I can think of is that while they functionally relate to the enemies I've changed them to, Snippets don't look like they can be jumped on and Bigbutts do. I may have to switch the two of those. Otherwise, I'm happy with how they turned out. I am loving what I see, so awesome! Woah, you seem pretty passionate about Banjo & Kazooie, good idea overall, would be cool to see in game. I'm passionate about a lot of games lol. This was simply one that I figured nobody else would bother working on. I haven't worked on this for a few weeks, but I plan on finishing it eventually. I'd love to see this get added, I love the banjo-kazooie series and would adore using these skins in the crossover. If not the levels and enemies at least the banjo skin. 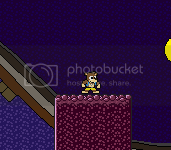 Glitter Gulch needs to be made 8-bit, to match with the Banjo sprites. Other than that, I can't give much input. Banjo-Kazooie is one game I've sadly yet to play. As for Glitter Gulch, I'm not sure what my plans are for that yet. The project in general actually. All that's left for the project is the themes, and I'm not quite sure what level of detail I want to put into them. I've taken wuite a long break from the project, and I'm not sure when exactly I'll return to it, but I know it's one that I will eventually finish once I feel motivated to start up work on it again. Actually, with sprite layering, Banjo would meet 8-bit standards. Definitely don't go full All-Stars for Glitter Gulch, though. Regardless of sprite layering, the colors themselves aren't from the 8-bit pallet. Maybe the ones on Banjo himself (those were inspired from someone else's sprite), but there's a lot from these skins that I copied colors straight from Banjo Kazooie (the game) itself. This project wasn't so much to make it 8-bit so much as to just have sprites of some form for the game. Are you talking about the background for Glitter Gulch or the theme itself? I plan to leave the theme the way it is, because it accurately represents the level, but I was already considering changing the background. The theme. It's way too detailed, it clashes with Banjo and the other map skins. Unless Glitter Gulch had HD graphics in BK, change it. This is what Glitter Gulch looks like. I appreciate your advice, but I think I'm going to leave the theme as is, because it's the most accurate representation of the level itself. I really don't think it's going to clash as much as you think it will with Banjo, especially considering the SNES Mario 1 graphics don't clash too much with the NES characters in Crossover. I do however still plan on changing the background for it, but I'm not sure how yet. 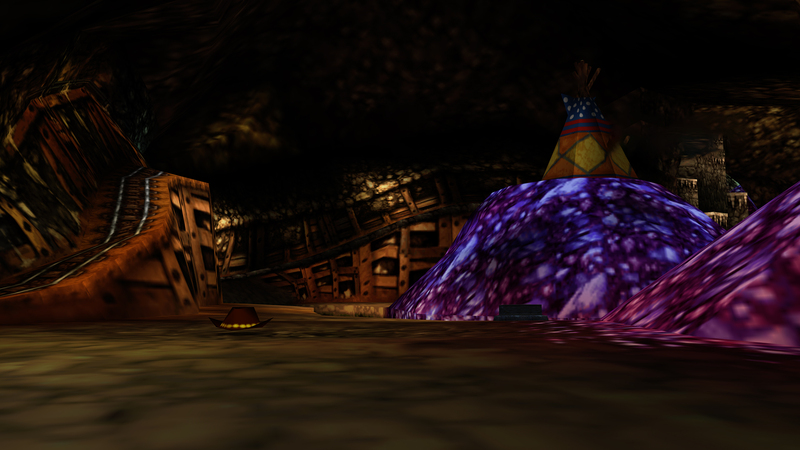 Besides, while the Glitter Gulch theme is SNES graphics, the Treasure Trove Cove theme is based directly off of the textures from Banjo Kazooie (an N64 game). I shrunk them down to fit essentially. Also, the reason this theme looks better than the Hero Klungo Savesss teh World theme is on purpose, since it's based off of a mini game in the xbox 360 game. Well, yes, I know why it's better than the Klungo theme. It's just way higher-res than the Banjo sprites, which is presumably the intended character to use on the theme. Does Banjo not look out of place here to you? Not personally lol. Metroid's levels looked more detailed than that does (again, with the exception of the background). Even Treasure Trove Cove looks more detailed than that does. Actually, I'm starting to like my background again, the height that you have it at looks awesome. If anything, you've just made me want to shade the lamp and tracks in the background. Heck, just talking about the skin is actually making me feel like coming back to it! Maybe after the metroid and kirby skins I'm working/planning on. Maybe I could try shading Banjo, but we'll see. The only problem I have is that it's a megaman(well, technically Bass, but he's a Megaman edit too) edit. I approve of this. I APPROVE OF THIS 9 TIMES! Good jorb. I've loved the Banjo series to death over the past years, and may I say this project is a true love letter. Nice work!